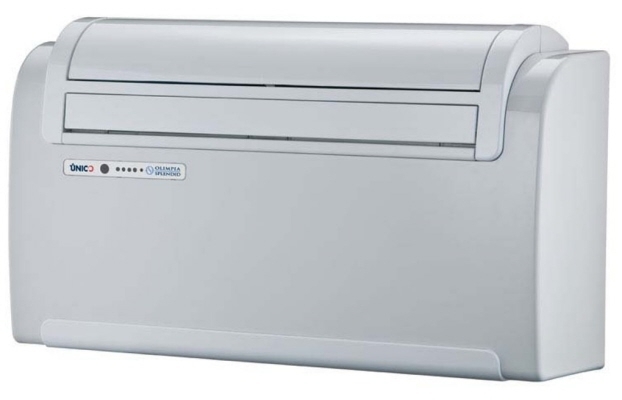 The Unico Smart 12 HP Air Conditioner provides both air conditioning and heating from a sleek wall mounted unit that does not have a outside condenser unit. This makes it suitable for applications where planning permission is difficult to obtain for mounting outside air conditioning units. A fixed through the wall air conditioning and heating solution that does not require the installation of an outdoor condensing unit whilst also offering a choice of high or low wall installation. All Unico Smart HP units are 'A' rated energy efficient providing high performance cooling and heating. 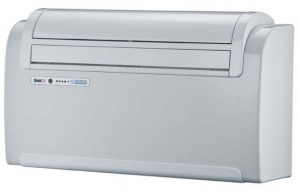 The unico range of air conditioners made by Olimpia Splendid one of Italy's premier air conditioning manufacturers are an all in one air conditioning unit. 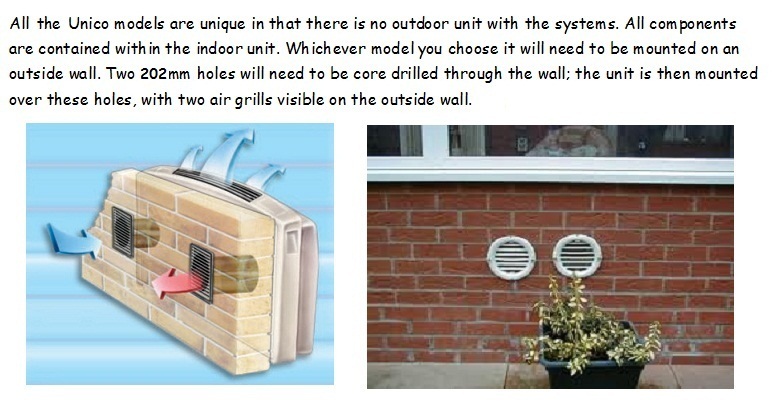 There is no cumbersome outdoor unit with both indoor and outdoor combined into one package. Stylish in design the single indoor unit is easily installed onto an outer wall via a simple bracket assembly, with two 202mm holes accessed to the outside providing the air supply required to operate the system. All that is visible from the outside are two round grill assemblies thus the environmental impact of these units is negligible. An independent air conditioner each unit then maintains the climate in each individual room. These units are ideal for applications where the fitting of an outdoor unit is impractical or where planning rules dictate that an outdoor compressor unit cannot be fitted.